In the article last week, we discussed what inflammation in the body looks like. This week, the topic will be how foods cause inflammation. The definition of this blog series uses for inflammation is a mechanism of the body to signal that something is making the body sick or unwell. After receiving the signal, the body begins the healing process. Cuts, scrapes, injuries, poison, and some allergies cause acute inflammation, while low-levels of irritants (like pollution), stress, food sensitivity cause chronic inflammation. There are certainly some distinct differences between acute and chronic inflammation. A completely different categorization of inflammation is autoimmune disease inflammation. This inflammation is chronic but also acute in nature. Acute and chronic inflammation both tell the body something is wrong. Chronic inflammation happens on a deeper level, and therefore the symptoms denoting an illness are much more subtle. Interested in taking our short Diet & Inflammation survey? Click here! In order to understand how food causes chronic inflammation in the body, it’s important to understand the gut. The anatomical part of the body “the gut” usually represents the small intestine. The small intestine’s structure is remarkable. Small is and isn’t a misnomer for this part of the body. It is half the size in diameter of the large intestine, which is technically small. However, it’s usually 20 feet long compared to the large intestine which is approximately 5 feet long. The length is, of course, impressive but the small intestine’s wall is notable as well. Upon looking at the small intestine—(either in the body or in a diagram)—there are numerous folds whose purpose is to stop food from passing too quickly. That design and function are to help the other ribbon-like folds within the folded segments, known as the mucosa, support the hairlike structures called villi to properly capture nutrients. The villi have microvilli on them, which is where the action really takes place. The villi and microvilli collect the micronutrients our bodies need by sending the vitamins, fats, carbohydrates, and minerals to blood vessels—it must pass through the villi. As amazing as the processes of the small intestine are, the small intestine is also delicate. The barrier that encases and supports the mucosa, villi, and microvilli is made up of cells and multiprotein structures that prevent leakage. Science refers to multiprotein structures that bind cells together as tight junctions. These tight junctions are not seamlessly bound together, though, and subject to separation under certain circumstances. Leaky gut is not as dramatic as the lining of the gut opening up and spilling out food into the rest of the body—(that would really be bad.) It happens on a microscopic level. When the tight junctions are exposed to harmful substances, they unbind leaving minuscule holes. Food particles—invisible to the naked eye but not properly digested—can seep through into the bloodstream. Proteins are not just a dietary component. Proteins are necessary for all living organisms—even bacteria. Proteins that pass through the tight junctions are a perfect example of how food causes inflammation. When foreign proteins from bacteria, for instance, enter the bloodstream, the body goes through a process where it flags that substance with antibodies and begins the inflammation-healing process with the immune system. The same happens when proteins from food seep through the tight junctions into the bloodstream—the body determines it as an antigen (a foreign substance) and begins the inflammation-healing process. It also flags that food-derived protein so it can remember it. Overexposure to antibiotics, chemical compounds (medications), germs, and alcohol can damage the tight junctions in the small intestine. Psychological stress can also damage the tight junctions in the small intestine through oxidation of the cells. Bloating, flatulence and general abdominal discomforts are signs and symptoms of leaky gut. There is so much more than just GI discomfort, though. 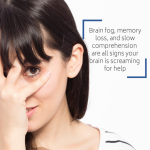 Malaise and brain fog—typical symptoms of depression—are common symptoms of leaky gut. There’s an intimate connection between the small intestine and brain. Medical professionals refer to this as the gut-brain axis. The gut and the brain have a mutual relationship. They send each other messages through the vagal nervous system, which is a cranial nerve connecting the brain to the rest of the body (heart, lungs, GI system, spleen, liver, colon, and even more if one were really to break it down.) The vagus nerve and its system have in particular an interesting relationship with the small intestine. The villi mentioned earlier as well as crypts found deep within the folds of the mucosa send 80% of the messaging between the two parties. In other words, 80% of the stimulation is coming from the gut and going to the brain. The brain only sends 20% of messaging to the small intestine. Plain and simple, when people’s guts are unhealthy, people’s brains are unhealthy. Scientists believe much of alcohol neuropathic issues come from the damage of the villi and microvilli, which are packed full of nerves. There are also studies about irritable bowel syndrome and comorbid psychiatric conditions. Imagine all the energy the body could have if it was not fighting off illness constantly. Now think how chronic inflammation can really exhaust energy levels. Especially in the case of leaky gut. The body is mistakenly inflaming itself because of foods leaking into the bloodstream. It has to use a good amount of energy to inflame itself to signal something is wrong. A good indication of a food sensitivity is skin problems. Hives, eczema, acne, and the like are just forms of inflammation. Acne, eczema, and psoriasis or a little more longlasting and chronic. Hives are a red flag you could be highly sensitive, if not completely intolerant or allergic to a food. The main culprits of inflammation that are food are dairy products, bread with gluten, & nightshade vegetables. In the following article, we’ll break down exactly why these foods cause inflammation in the body. No speculation, purporting, or factualizing—just the science. As a prelude to the previously mentioned food categories and how they cause inflammation, garlic is an interesting food that causes profound inflammation in people with autoimmune disorders. Garlic is known in numerous cultures for its powerful medicinal-like properties to keep people active and healthy. The science shows that garlic really can knock out an infection. Hieroglyphs on Egyptian pyramid walls show workers being given garlic to stay fit, which is so telling of its powerful capabilities. Garlic has pro-inflammatory effects on the immune system—it revs up the immune system to fight bacterial, viral, and parasitic infections. Ajoene, allicin, and thiosulfinates are the three primary compounds in garlic’s chemical makeup and are considered to be organosulfur giving garlic its punch. Ajoene, allicin, and thiosulfinates stimulate the immune system by increasing the macrophage and lymphocyte—two types of white blood cells—activity. Researchers suspect allicin, though, to be the most potent of the three. Studies have shown allicin fighting Plasmodium falciparum (the most deadly kind of malaria) and aiding in weight loss (even with a poor diet). An individual with an overactive immune system does not want to stimulate the immune system any further. Countless anecdotes of people with lupus and rheumatoid arthritis report inflammatory flares—which are very painful—after eating garlic. With all the advancements science has made, the human body is still a mystery on some levels. The medical community is beginning to unravel the connection between the gut and the brain as well as which foods negatively impact the small intestine’s structure in chemosensitive and mechanosensitive ways. Gut permeability and leaky gut is a serious condition that comprises the small intestine’s architectural complexity and activates the immune system. Other foods, especially for people with unique disease states, can activate the immune system even if leaky gut is absent from the case. All in all, food is powerful and needs to be treated as such. Next week in the Diet and Inflammation series, we’ll break down the biochemistry of pro-inflammatory foods to give you the real science and help you determine if those foods are right for you.